J.L. 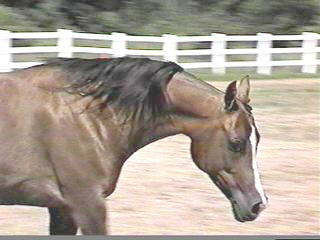 Kharismatic is the 1990 Russian/Spanish daughter of B. A. Loriana. 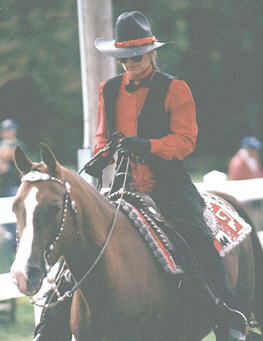 "Kris"
has been successfully shown in halter and hunt, and is being started in western pleasure. Kris possesses a wonderful temperament and works hard to please anyone she works with. In most of her photos she appears to be a bay. 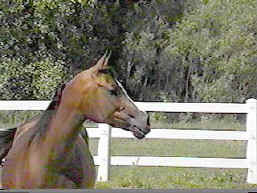 In reality, she is a chestnut with a dark, almost black, mane and tail. Her coat has a gold iridescent shine that resembles a copper penny. *Karizmanov was sired by the Russian bred stallion Mashab and is out of the straight Russian brood mare, Kira. 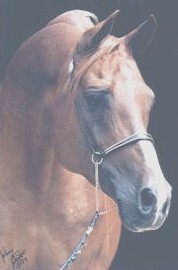 *Karizmanov is of the Bairacter sire line, well known for classic head type, long level croups and high tail carriage. In addition, he has two crosses to the very athletic Kuhailan line. *Karizmanov's Paternal Grandam, Madera, is by Arax. Arax is the sire of Nabeg, *Boltonka, Naivny, Tamerlan and the Grandsire of *Pesniar, *Monokl and Marsianin. Madera is out of the beautiful mare Metropolia. She is also a full sister to Mammona, the founder of the most influential mare line, at Tersk. *Karizmanov's maternal lines both trace to the Sakawi I line, known for their extreme flamboyance and style. Aswan is found twice through *Karizmanov's dam Kira, giving him a well balanced pedigree for prepotency.